Yesterday (March 18) was my mother’s birthday. She would have been 78 years old. She died at age 56. My mother had been seriously ill at different points in my childhood, so I had contemplated her death many times, beginning at 5 years old when she needed her first open heart surgery. Not that I understood what “death” meant at that age, but I was aware of the possibility that she might not come home. Somehow though, miraculously it seemed, she did come home… over and over, after every operation. By the time I was 22, my mother had beat the odds so many times, to my young mind she seemed almost invincible, like a frail old tree that has managed to survive multiple natural disasters. For this reason, despite her history of bad health, it was a shock when one day three weeks after my 22nd birthday, she collapsed in front of a neighbor’s house while walking the dog. Two hours later my brother broke the news, and I too collapsed (he caught me). It felt as if the entire world had been yanked out from under my feet. My mother was the anchor and center of our family, the one person my siblings and I knew we could always turn to and rely on, a constant and unwavering source of unconditional love. She was an artist, music lover and world traveler. She went back to college in her mid-40’s to finish the degree she had abandoned when my parents married. She finally learned how to drive after they split up twenty-five years later. In the year before she died, she and a high school girlfriend did a European road trip, visiting Switzerland, Italy and Germany. She also visited New Orleans for the first time, and returned saying she could move “in a heartbeat” to either New Orleans or Florence, Italy. She spoke English, Hebrew and German fluently, the latter only with older relatives. It always surprised me to hear her laughing with her aunts, or saying something under her breath to her brother, in German. She once told me that she liked writing poetry in English more than Hebrew (her native tongue) because English had so many more words to choose from. She loved movies, literature and laughter. A few of her favorite authors were Philip Roth, Toni Morrison, Sonia Sanchez, James Baldwin and Somerset Maugham. She was beautiful: rosy cheeks, jet-black hair (later, salt & pepper) and deep blue eyes framed by beautifully arched eyebrows. Her only regular beauty regiment was applying face cream and plucking her brows. She never wore a stitch of make-up, and she never died her hair. She was opinionated, but also fair-minded and wise. My older siblings and their friends would often seek her counsel. Me being the youngest and barely out of the rebellious teenage years, seeking her counsel (and listening to it) was still relatively new. We were just beginning to make the transition from the traditional mother/daughter hierarchy to adult(ish) friends when she died. 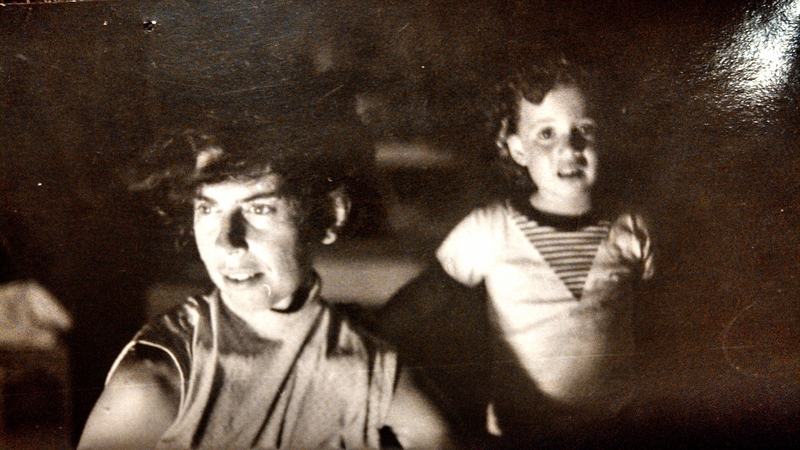 As cliche as it sounds, there was something special about my mother. She once found a shiny bauble on a Tel-Aviv sidewalk, only to find out that it was a diamond worth over a thousand dollars. The boyfriend of a friend, upon meeting my mother for the first time, gave her the crystal necklace he was wearing off his neck. His girlfriend urged her to accept. Strangers, children and animals were all drawn to her. Hours before she collapsed, she had received, separately and completely by coincidence, wonderful news from both of my siblings, news that she had been waiting years to hear. My last conversation with her was a bit more tense (something I still regret), but we did speak about the college film I was directing, and I knew she was proud of me. My siblings and I have a theory that, with all the good news she heard that morning, she might have died of happiness. We never asked for an autopsy because we felt like her body had been through enough, but her doctors had their theories. They also revealed their genuine surprise that she had lived as long as she did. These men of science credited her will to live as the reason. Physically frail but iron-willed, she left her mark on the world. Categories: Family, Grief, Inspiration, Loss, Love, Memoir, Memories, Mothers, Women, Writing | Tags: anniversaries, love, mother's love, mothers and daughters, remembering loved ones, the will to live | Permalink. People have varying opinions on the origins and meanings of dreams. This post isn’t meant to be a discussion of either, rather an observation on the emotional power dreams can carry. For those of us who have lost loved ones, it can be quite an experience to encounter the person(s) in our dreams. It can feel as if the person has just “visited” or like they’re trying to tell us something. In some cases, it can feel mysterious, jolting, even upsetting. For years after my mother died, whenever I would see her in my dreams she ignored me – the opposite of how she behaved in life. She had always been the emotional anchor of our family. After my parents split up and my father moved away, in many respects she became the center of my world. Yet, to this day, she has never spoken to me in my dreams. The last time I dreamt of her, she was the special guest at a party and when she entered the room, everyone applauded. I felt thrilled, curious and proud to see her looking so beautiful and radiantly happy, almost like a movie star. Of course I still wish one day she would look at me or say something (what I wouldn’t give for a hug), but I have learned to simply be grateful in her presence and respect her independence, for in my dreams she always comes across as a strong, independent woman, comfortable in her own skin and not defined by motherhood. With Kaz it’s been different. For one, I have dreamt of him more often in the past two years than I have dreamt of my mother in the past twenty. Second, we do interact in my dreams, both physically and verbally. Some of my dreams have been “R” rated. Some have been upsetting, others odd, but most have been good. After a while, the nature of our relationship in my dreams changed, as if he was evolving with time, or I was, or both. Once I dreamt that he was living with another woman. I felt happy to see him again, especially looking so happy and healthy, but found it difficult to contain my jealousy. That dream ended with me leaving to take a walk around the block because I couldn’t take seeing them together anymore (and pretending to be okay with it). Last night I dreamt of him again. I only remember the end. We had just finished having dinner with a bunch of friends in a strange city, perhaps Europe, and Kaz had to leave. He walked towards a waiting vehicle, like a van or small SUV. I actually felt shy about following him. Were we still together? Was I still his wife? What was I to him now? No matter what the situation, any time I see him (or my mother) in a dream, it always feels like a gift. Categories: Bereavement, Grief, Memories, Widow | Tags: change, dreams, Kaz, love, relationships, remembering loved ones, subconscious | Permalink. Of the two miserable choices – drive all the way back to pick up these items or wait until the morning and hope they’re still there – you choose the former. As you turn back around, you are faced with thick, Friday night traffic. The freeway is a parking lot. You take the first exit, then surface streets all the way across town, another 45 minutes. Your skin starts to itch and twitch. Your baby looks at you questioningly. This is taking a lot longer than usual, her eyes say. I’m really hungry and tired. When can I get out of this car? She can’t talk so you might be projecting. But she does not look happy and she’s fidgeting, which is the precursor to whimpering, then full out crying. Are you calm and collected in this situation? If so, please tell me how. He would have acknowledged that the situation sucked but encouraged me to think the best and focus on driving safely. He would have told me that chances are my stuff was still there, but IF not, I could cancel accounts and change passwords right there at the office, probably faster than someone could take advantage of them. He would have urged me to not beat myself up, and promised to make me a cocktail when I got home. “Stay calm. Call me as soon as you get to the office,” I could hear him say. Talking myself off the ledge wasn’t quite as effective, but it did help. By the time I got to the office, I had at least stopped crying. I left the puppy alone with the windows cracked while I ran up to my desk. My wallet and the notebook were still there, right where I left them. When I came back to the car, the puppy was so stir crazy she jumped out and gleefully ran around the empty parking garage just as a senior executive was getting out of his Mercedes. Why was he coming back to work? I wondered as I ran after her. When we finally made it back to the neighborhood, 3 hours after I originally left the office, I bought champagne instead of beer, and some Ben & Jerry’s. The next day we went to Joshua Tree… where all our worries flew away in the wind like tumbleweeds. Who talks you off the ledge? Or how do you talk yourself off? Categories: Grief, Life, Widow | Tags: dealing with stress, good advice, inspiration, remembering loved ones, stressful situations, taking care of yourself | Permalink.